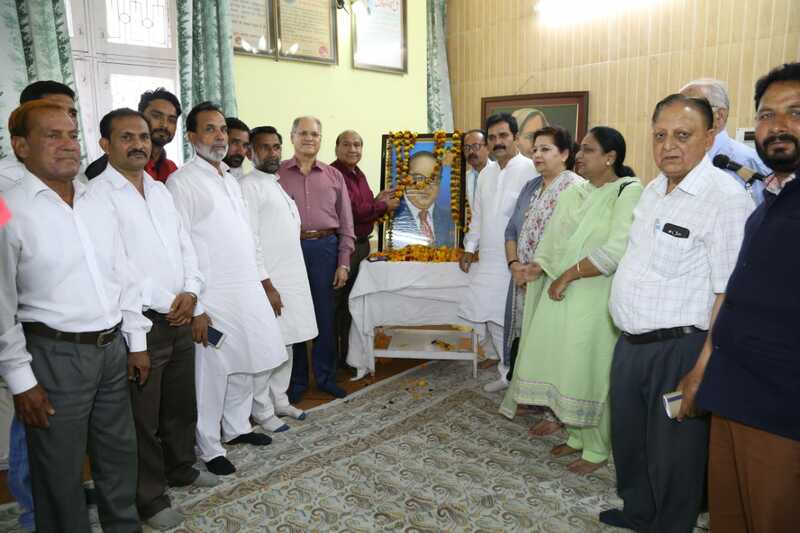 JAMMU Apr 14: National Conference on Sunday described Baba Saheb Dr B R Ambedkar as a great visionary, saying the legendary leader worked tirelessly to foster egalitarian society and shed caste discrimination across the country. "The people will always remember the architect of the Constitution of India for giving best Constitution in the world", State Secretary Mr Rattan Lal Gupta said while paying tributes to Baba Saheb on his birth anniversary at a function held at Sher-e-Kashmir Bhavan here this morning. Mr Gupta said that adhering to the principles of the Constitution and ensuring the fruits of democracy to reach all would be best and befitting tribute to the great luminary. He said the ideology of the legendary leader is humane, which is needed to be emulated. "Let us fulfill his dream by creating a society based on equality and social justice", he added. The function was organized by the NC SC Cell and its Co Chairperson Mr Vijay Lochan threw light on various facets of the life and struggle of Dr B R Ambedkar. Paying homage to the legendary leader, Mr Lochan said his unflinching commitment towards social justice brought about a revolutionary transformation in Indian social order and helped in carving a society based on equality, justice and opportunities for all. Speaking on the occasion, former MLC and senior leader Mr B. R. Kundal said that Dr Ambedkar dedicated his entire life for the welfare of weaker sections and his contribution in that regard was exceptional. "There is greater need for collectively working for welfare of weaker sections of the society so that social inequality could be minimized", he maintained. Mr Kundal said the best tribute to the great leader would be to imbibe the spirit of oneness which alone can lead the nation towards peace, progress and prosperity.